Due to my love affair with rice, my poor Canadian husband doesn't get potatoes as often as he would like. I needed to cook something yesterday I could leave on the stove while we went to Brutus’ baseball game and figured I’d just boil up some spuds and make him mashed potatoes when we got home. Have you ever watched a TV show or movie where there’s a crime to be solved and the star detective, who seems to have some sort of clairvoyant ability, has a moment when time stands still and she gets these flashes of images of the crime being committed and has a breakthrough in the case and knows exactly what she needs to do next?? That’s EXACTLY what happened to me yesterday. Kind of. Well, not really since I didn't catch a killer and I don’t have ESP. But I opened the refrigerator and these flashbulbs started exploding in front of me. 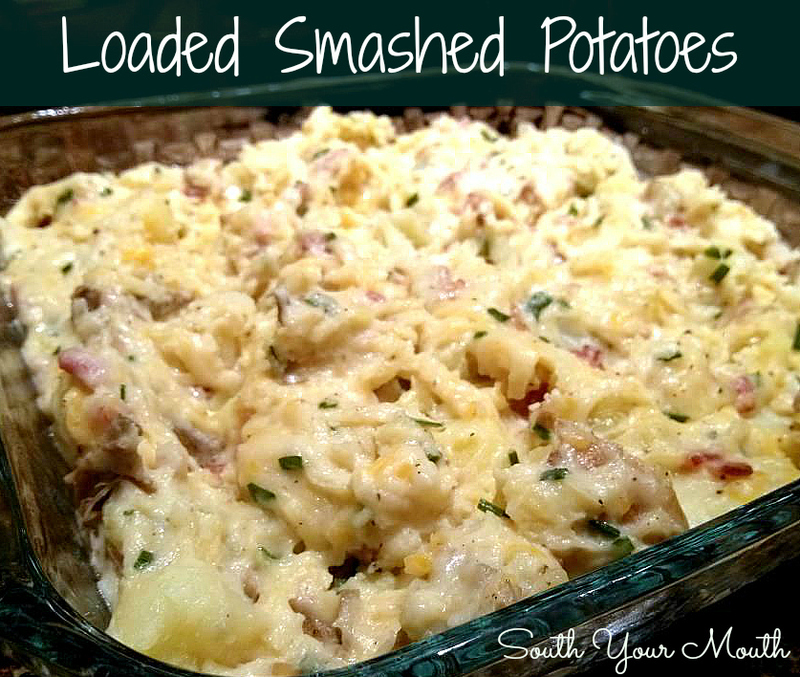 Then I gasped for air and staggered and held on to the refrigerator door and knew exactly what I had to do: make the motherload of all smashed potato dishes with all the things you’d want on a loaded baked potato. Wash potatoes and cut into large cubes (about 6 cubes for a medium potato). Do not peel potatoes. Boil in liberally salted water until tender (about 15 minutes). Drain potatoes and add to a large mixing bowl. Meanwhile, sauté bacon over medium heat until slightly browned. Add garlic and continue cooking for two minutes. Add bacon and garlic (with pan drippings) to potatoes. Taste potatoes for saltiness then add salt and pepper to taste. Add sour cream, butter, cheddar cheese and chives (reserving some chives for garnish if desired... which I totally forgot to do) and stir and mash with a large sturdy spoon until all ingredients are thoroughly incorporated and potatoes have reached your desired consistency (I like mine pretty chunky). If you use a starchier potato, you might have to add a tad of milk at this point if the dish seems too dry. Spoon potatoes into a medium-sized dish and serve. Alternative casserole preparation: Add 1/4 cup milk to potato mixture when adding the sour cream. Spoon mixture into a small casserole dish and top with 1 1/2 cups shredded cheese of choice (I think Monterrey Jack would be amazeballs). Bake at 375 degrees for 25-30 minutes or until cheese is bubbly and slightly browned. Will this work with white taters? Sure! But you might have to add a little milk if it gets too dry... "If you use a starchier potato, you might have to add a tad of milk at this point if the dish seems too dry." II'm glad you had the "aha" moment. I'm going to do this in casserole form. This may replace just plain ol' mashed potatoes on the Thanksgiving table. Just found your page via Facebook. I wanna make ALL your recipes TODAY! I was wondering if you have a Pinterest page? Would this dish be just as good if prepared the day before, refrigerated and baked the next day? What is a "leftover" piece of bacon? Never seen one. I made the potatoes for Easter dinner this year. I made the potatoes about 3 hours ahead of time and put the potatoes in a casserole dish and warmed it in the oven. I did not add the cheese - the dish was wonderful without adding the extra calories.